Which SuperTopo guidebooks include a topo for The Nose? 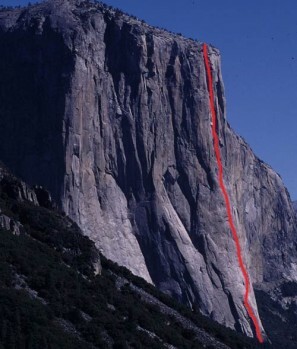 After missing a chance to make the firrst ascent of Half Dome, Warren Harding knew there was only one other accomplishment that could surpass it—the ﬁrst ascent of El Capitan. Because no technical rock climb of this scale had ever been attempted, Harding employed expedition tactics of using supplied camps linked by ﬁxed ropes. In addition, the Park Service mandated that the climbers use ﬁxed ropes so that a rescue would not be necessary. On July 4, 1957, six days after the ﬁrst ascent of Half Dome, Harding and his team began their historic journey. After reaching Sickle Ledge in three days, the team pulled off two wild pendulums and faced the next obstacle, a series of 300-foot long, 2–3" wide cracks. Standard pitons that large did not exist, but Harding had come prepared. He had four enameled stove legs that Frank Tarver had scrounged from a Berkeley dump. Leapfrogging the 9" monsters up the continuously wide cracks, the team made it to within 100 feet of Dolt Tower before descending. In May 1958, Harding and the team reached the Boot Flake, a feature that mysteriously ﬂoats on the wall with no visible means of attachment. Each pin placement caused the whole feature to groan and expand. On top of The Boot, seeking the next crack system, Harding unleashed the wildest pendulum ever done, now renowned as the King Swing. By fall the route was pushed up to Camp IV, and both climbers and the Park Service wanted to wrap things up. Harding had been the leader from the start, and as problems arose and partners bailed, it was his determination that kept the project alive. Of the eight climbers who contributed to the ﬁrst ascent, only Harding was involved for the duration. On November 1, 1958, the team, now consisting of Harding, Merry, Rich Calderwood and George Whitmore, prusiked to their high point at 1,900 feet, and launched their summit campaign. The Great Roof, although appearing from the ground to be the crux of the route, was easily dispatched, and the climbers moved steadily up to Camp VI. At this point Calderwood suddenly dropped out, leaving Whitmore to move loads and Harding and Merry to swing leads up the spectacular upper dihedrals. Story of The Nose-in-a-day by Jim Bridwell. Tons of links for The Nose from John Black.